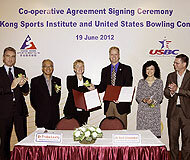 20th June, Hong Kong: The Hong Kong Sports Institute (HKSI) today signed a co-operative agreement with the United States Bowling Congress (USBC). 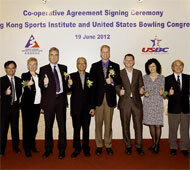 Thanks to the Hong Kong Tenpin Bowling Congress who facilitated the link, the signing signifies the establishment of a long term partnership between the HKSI and the USBC in the exchange of high performance training, sports medicine and sports science research, testing and scientific data. The Signing Ceremony was officiated by Mr. Jonathan McKinley JP, Deputy Secretary for Home Affairs, Mr. Tang Kwai-nang BBS JP, Vice-Chairman of the HKSI and Ms. Vivien Lau Chiang-chu BBS JP, Chairman of the Hong Kong Tenpin Bowling Congress. Mr. Neil Stremmel, Managing Director of the USBC and Dr. Trisha Leahy, Chief Executive of the HKSI represented the two organizations for the signing of the Co-operative Agreement. Mr. Tang Kwai-nang expressed his support for the co-operation and said, "The Co-operative Agreement to be signed today is essential for both hardware and software development and maintenance of our new Tenpin Bowling Center which is about to be completed. "In order to provide an environment in which elite athletes can realize their full potential and to achieve their highest level of sports performance, exchange of knowledge in areas like sports science research, high level sports training, related sports technology applications and talent identification programs plays an important role. "Together with all the hard work and effort of athletes themselves and support from coaches, the co-operation with the USBC will definitely facilitate and enhance the elite athletes' performance." At the ceremony, Mr. Neil Stremmel expressed, "Both organizations are dedicated to providing professional support to the development of bowling. The USBC serves almost two million youth and adult members in the United States and the International Training and Research Center (ITRC) under the governance of USBC is well equipped with state-of-the-art facilities and technologies. "The long-term co-operation in exchanging athletes and expertise on various areas between the two organizations will benefit both the Hong Kong and the USA teams." Ms. Vivien Lau Chiang-chu also appreciated the collaboration and said, "Thanks to the Government's HK$1.8 billion funding for the redevelopment of the HKSI, the new HKSI Tenpin Bowling Center will be a state-of-the-art technical training center for elite athletes. "The Hong Kong Tenpin Bowling Congress has been delighted to facilitate this partnership between the HKSI and the USBC, and we foresee a continuous improvement in the standard of our tenpin bowling athletes." Hong Kong tenpin bowling athletes, Wu Siu-hong, Tseng Tak-hin and Yeung Wai-ki also shared their experiences and insights from their training at the ITRC earlier this year. Wu said, "The training was rewarding and we are all impressed by the world-class facilities and technologies at the ITRC." Tseng and Yeung echoed Wu's views and looked forward to further training opportunities at the ITRC, and training with other National Teams from Asia, when the new Tenpin Bowling Center at the HKSI is completed and in operation. 9th Jun: Champs fought hard for win.